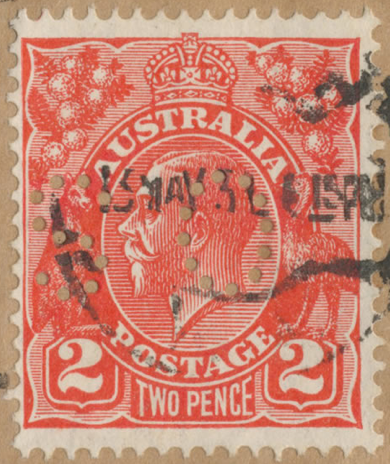 11 May 2012 Prestige Philately in Melbourne Australia sell a 2d red perf 'OS' as per BW #102ba but with the Perfin Inverted tied to long OHMS piece by Perth slogan cancel. The item was lot lot 184 and sold for $2600.00 + buyers against an estimate of $500.00. This in from perfin club member John Graham "This particular stamp sold on ebay in Oct 2002 for $302.50."